TechCrunch's last Summer CrunchUp was all abour Social commerce: social currency, social savings, social coupons and social recommendations... See all about it here. PIXmania's turnover is up 15% to 897 million euros, and its net profit is up 40% ... The group intends to diversify even more, engage in online travel and expand its network of stores. Also, the group's e-commerce outsourcing services, e-merchant, reached EUR35m revenues in the last fiscal year. Ratings and reviews vendor Bazaarvoice is tying in with Google, enabling its 800 customers to display ratings and reviews from their websites in Google search results. And it will probably increase the conversion rate of retailers using Bazaarvoice, as shoppers coming from a product-specific review in Google's search results will be even more qualified. View more presentations from zappos. Are you ready for "Extreme Retailing" ? E-commerce has evolved more in the last 12 months than in the last 12 years, with a combination of entertainment, game mechanics, and innovative shopping models. I so agree with Megan (and with Jochen and Jason from Exciting Commerce, a recommended read by the way...)! View more presentations from Michael S. Levy. First off, Happy New Year everyone! 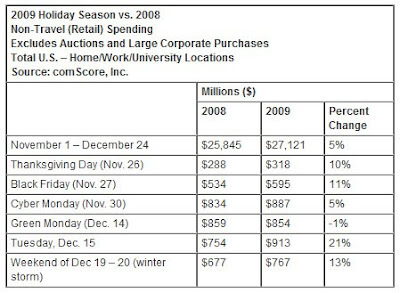 According to comScore, online Holiday sales (from Nov 1st to Dec 24th) reached $27 billion, a YoY growth of 5%.